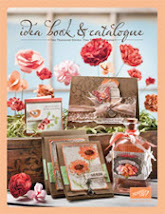 Two scrapbook pages in two days - what's going on! 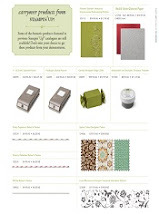 This page was done for a class that will be taught next week (so if you are interested in attending the class - you can see my website for details or email me). 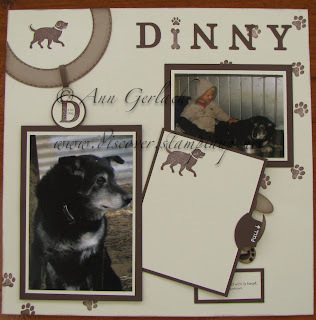 Anyway back to my page - it was done using the lovely D is for Dog stamp set and I decided to use photographs from our lovely farm dog Dinny, who sadly after +14 years of being a cattle dog died in July this year. These photographs were taken in January 2010 when we visited the farm, our son loved sitting on the dog bed patting and chatting to him, not realising that Dinny was completely deaf! 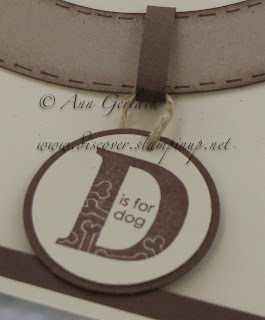 I wanted to give the effect of having a dog collar on the page, so used the circle scissors plus to cut a 5" circle an then used a sponge to age it and a chocolate chip marker to draw on faux stitching. The dog tag was made using the stamps from the set and held on using a loop of card stock and hemp twine. There is journaling room on a pull out sheet behind the main photograph - I used the same dog stamp image on the journaling area as in the centre of the dog collar. 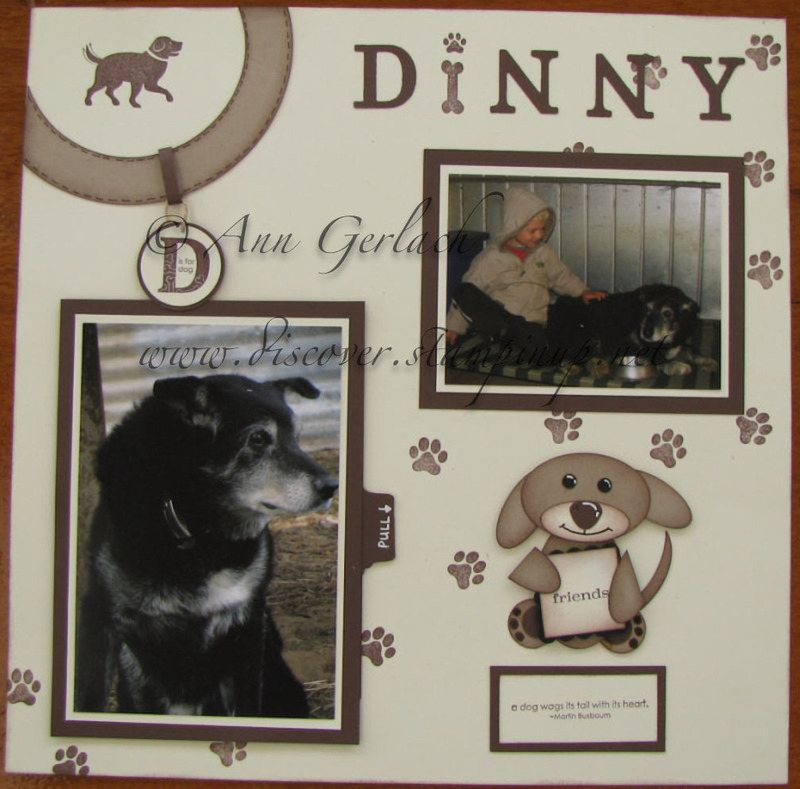 I also thought of adding a few bone stamps on the page, but as Dinny has an "i" in it - I used it on the title instead along with letters cut from the Junior Timeless Type alphabet. I sponged all of the edges of the 12"x12" page with chocolate chip ink as well. The random paw prints going across the page were originally just going to be a tidy border, but as Dinny had a mind and personality all of his own, I figured he wouldn't have just staying walking in one straight line! 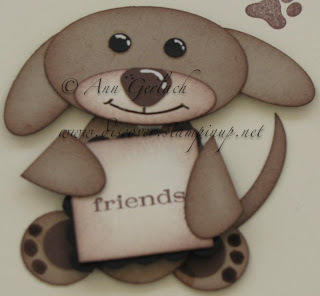 The punch art puppy dog is not my design, it is from Valita's blog, isn't he cute? How cute is that punch art puppy! 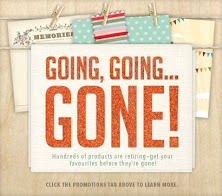 All content is the sole responsibility of Ann Gerlach, Independent Stampin' Up!® Demonstrator and the use of, and content of the classes, services, or products offered on this website are not endorsed by Stampin' Up!offered on this website are not endorsed by Stampin' Up!Up!